Home » News » Station Park gets underway! Residents, commuters and visitors travelling along Liverpool Road will have noticed a lot of activity taking place on the Station Road embankment recently. This is the start of an ambitious project to transform the embankment into an enchanting accessible green space for all to enjoy – to be known as Station Park. The embankment area has been in a poor state since the Liverpool Road Bridge was demolished in the mid-1960s and over the years has become very overgrown, resulting in this stretch of road becoming an oppressive and unpleasant place to walk along or drive past. Having purchased the land from the Manchester Ship Canal Company, HDT drew up plans to improve the aesthetics of the embankment area. These were shared with the Irlam & Cadishead Community Committee in 2017 and were well received. 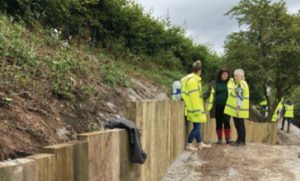 Since then the embankments have been regularly maintained whilst the engineering details were being drawn up and discussions held on the practicalities of working on such a challenging area. HDT are very excited that, at long last, work is now underway. The first phase of the project is to clear the overgrown vegetation and provide a safe off-road pathway from Liverpool Road onto and through the Park. The path, which will gently lead up to a higher level open green space, will be accessible for pedestrians, cyclists, wheelchair users and pushchairs. From here steps will lead further upwards through the Park to Station Road where the path will connect with the car park pedestrian walkway leading to the station. Following completion of the pathway, the aim is to transform the embankment into a magical green space that everyone can enjoy and be proud of. Future phases could include further improvements to the landscape, the introduction of various seating along the pathway, as well as creative forms of art to celebrate the areas rich heritage in a fun and educational way. Further information will be shared about the project as work progresses and plans for artworks are developed.